Gujarat state is situated in the western part of India. It is also called as ’Jewel of Western India’. Gandhinagar is the capital of Gujarat. Ahmedabad is the largest city of Gujarat. There are several reputed engineering institutions and colleges which are located in the state. Some of these are Indian Institute of Technology, Government Engineering College, Sardar Vallabhbhai National Institute of Technology, and many others. As per census 2011, the literacy rate of Gujarat is 79.31%. 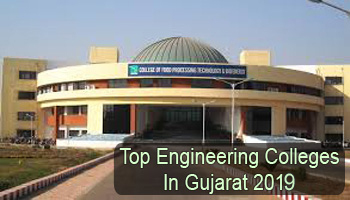 Through this article, students can check a list of Top Engineering Colleges in Gujarat 2019. At Sarvgyan.com, we have mentioned the list of top engineering colleges in Gujarat after gathering information from various sources. The list contains the government, private and government-aided, IITs, NITs and many other colleges. With the help of this list, students can choose the best-fit college for them as per their preference. The admission to B.Tech courses will be provided through the national level entrance exam, i.e. JEE Main. Through this exam, students can also get admission into B. Arch course. The admission to engineering courses will also be offered through state level entrance exam, i.e. GUJCET (Gujarat Common Entrance Test). To get admission in the PG level of engineering, students have to appear in the GATE entrance test. Various colleges & institutions of the state offer the different engineering specializations. Some of the trending specializations are Aeronautical Engineering, Computer Science and Engineering, Mechanical Engineering, Civil Engineering, Electronics and Communication Engineering, Electrical Engineering, etc. If you have any other queries about Top Engineering Colleges in Gujarat 2019, you can leave your comments below in the comment box. What is the rank of S.P.B. Patel Engineering College (Saffrony), District – Mehsana, Gujarat ? What is the review of that college ?